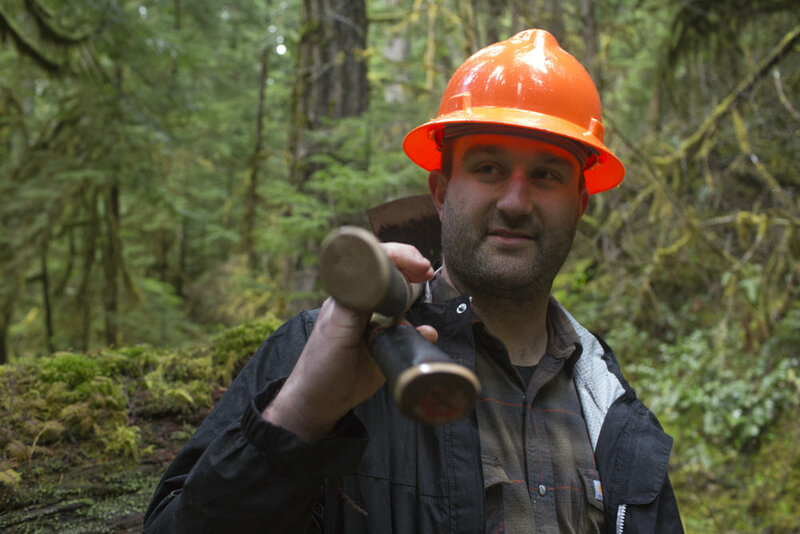 When I got involved with The Oregon Timber Trail Alliance, one of my goals was to make trail work a bit less intimidating. My partner and I have been getting more and more into doing trail work and we were a bit at a loss to explain exactly we were doing out there. 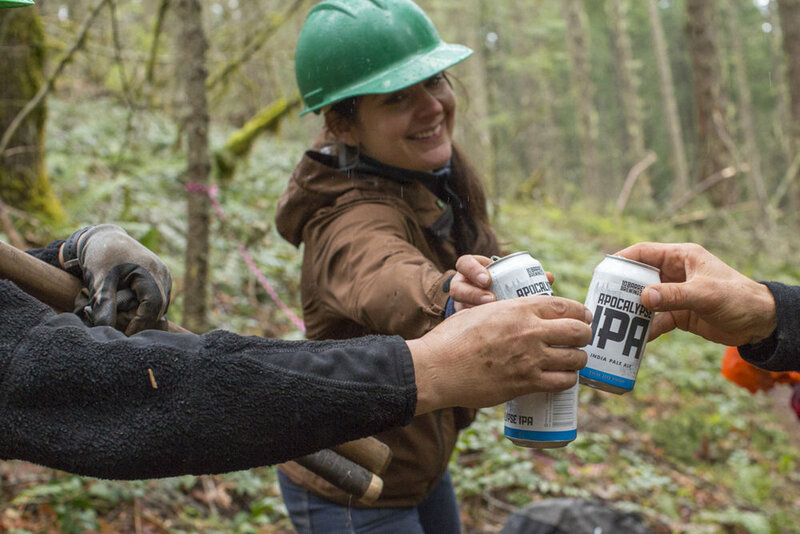 It’s not a knock against any of the folks running trail work parties – it’s just that most work parties are about doing, not learning. We left feeling like we had made a contribution whether working all day to improve drainage, or helping to sketch out new trails, but we wanted to really understand exactly what we were doing out there. 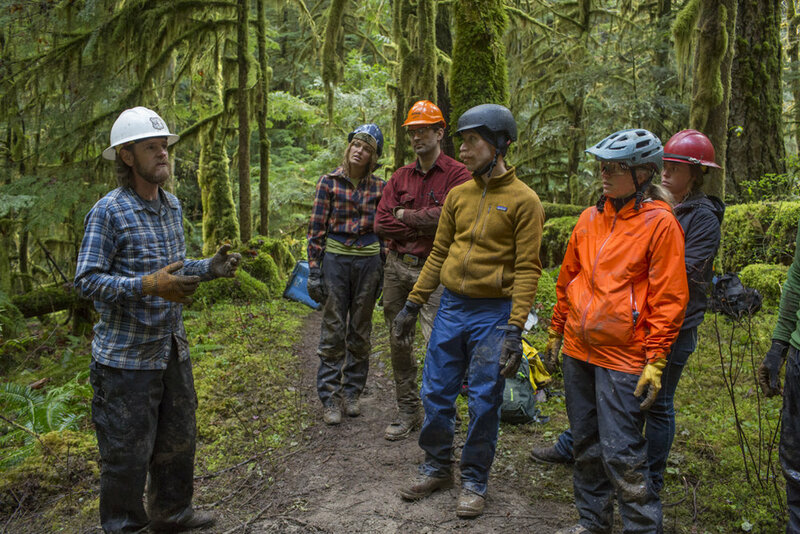 We wanted there to be a class that really explained trail work in a deep way – we needed to ask the trail master. Luckily, we have Kevin Rowell in the mix! Kevin is the USFS trail master at the Middle Fork district (Oakridge area) and he also happens to be an avid mountain biker - and all around knowledgeable guy. Basically, he’s the guy you want to learn from. Personally, I got tired with just “using” trails. I’ve been riding mountain bikes on and off for 30 years. It was time to give back a little more. Luckily for all of us, the Oregon Timber Trail is 670 miles long and much of it is remote and in certain sections are in disrepair. 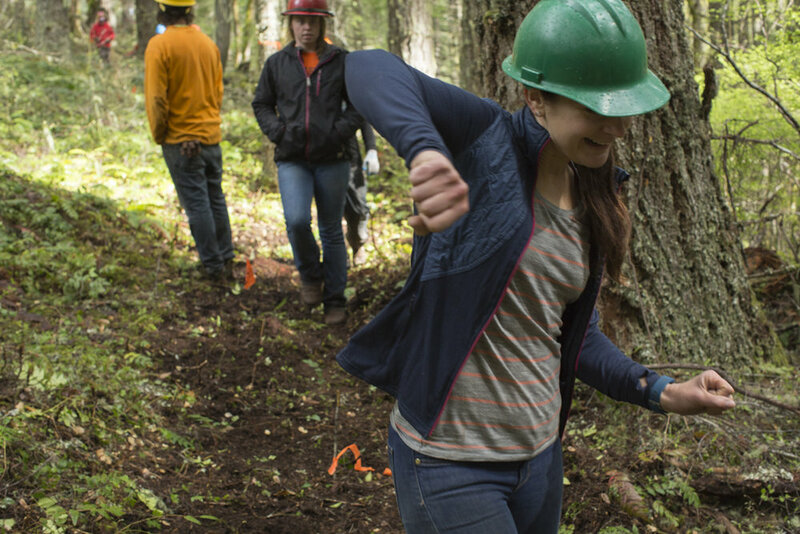 The Forest Service does its best to maintain the trails that get constant use – but they have much more work than they can do every year and they rely heavily on volunteer labor. Also lucky for the Forest Service, is that mountain bikers are motivated and they’re usually pretty fit and have no problem doing the work – get this, they even see it as a fun challenge. So, we all gathered at Tired Dog Ranch Friday night. Tired Dog has been an oasis in Oakridge for events like The Cascade Cream Puff and Trans-Cascadia. Sally Harmon is the owner and she very much goes out of her way to make sure her guests are happy. We rented the Cascadian cottage, which turned out to be a perfect place for our group meals. Hannah Carlos, who will be preparing food for upcoming OTT trail work parties kept everyone well fed with delicious dinners. Base Camp, 10 Barrel and Humm Kombucha were kind enough to provide liquid refreshment. Friday night everyone gathered at the cottage, and got to know each other a bit. Saturday morning we awoke to a beautiful spread of oatmeal, yogurt, fruit, and all the fixings, and of course mugs of Stumptown coffee. Bless you Stumptown. We love our morning coffee! Sandwiches were prepared to go, and we all made our way down the road to Greenwaters Park where we would start the day with a classroom session led by Kevin. I think we were all blown away by sheer depth of what Kevin got into. 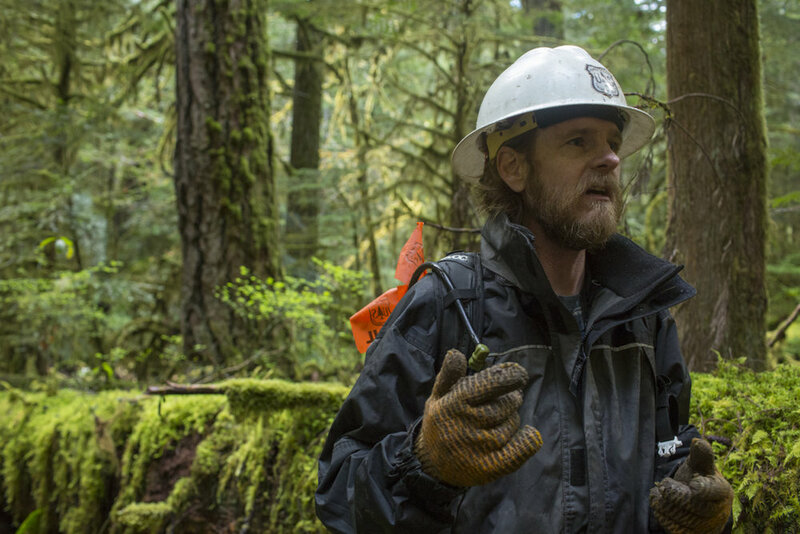 USFS is always very focused on safety, so Kevin got into details of situational awareness, communication with dispatch (Eugene if you’re working in Oakridge) and how to communicate in an emergency situation. We learned about trail alignment, how to shape climbing turns, and stone pitching among other things. 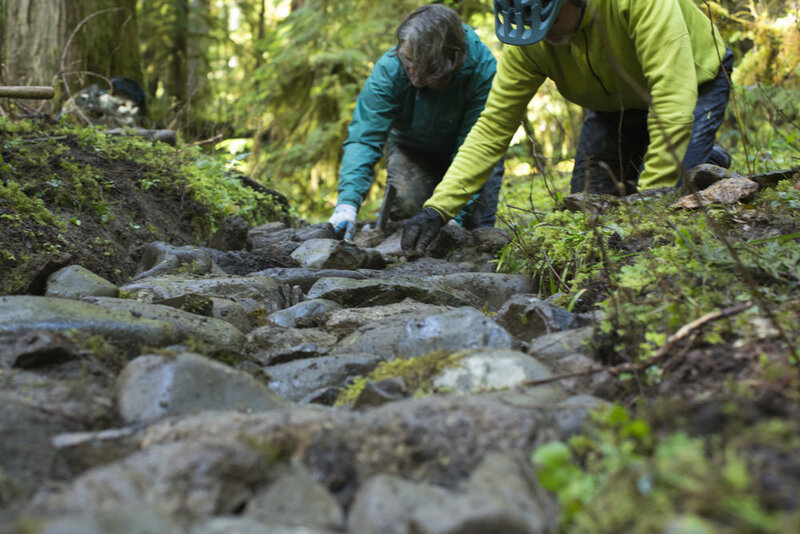 Ultimately we learned about a trail building and maintenance philosophy that is light-handed and creates a backcountry feel. We learned the three basics, which are: 1. Log-out specs – those bucking logs should consider if there is a need to “corral” the trail, meaning you don’t necessarily cut out a down tree to the maximum width – maybe you want to reduce riding speeds at this point in the trail, so you have the option to leave the trail a bit narrower. The rule of thumb is when you are standing on the ride line with your arms outstretched, whatever you can touch should be cut. We also learned to ride the line in your mind – imagine where you might be leaning your bike and possibly need more room on a log cut to avoid broken knuckles. Finally, get your rounds at least five feet off the trail. 2. What are the brushing specs? You need to consider the sight lines on corners. Do you want to brush the fill slope or not? Just when our minds were about to explode and we were no longer to retain any more information, it was time for lunch. After lunch we loaded up and went to one particular trail that had some drainage issues. In one spot, the trail was worn down and rutted, so one group harvested rocks to fill in the low spot, with rocks laid on end, with sand poured in between the rocks to provide the cement. A second group rebuilt a culvert – the man made metal culvert that had been in use was too small and had become clogged, so our group dug it out and built a new, larger culvert from found rocks. We were all amazed watching it come together, digging out, scavenging for suitable stones, and carefully placing for maximum effect. It’s time-intensive work, but it all came together relatively quickly as jackets and Rubbermaid bins were put into use to carry rocks from the streambed and adjacent hill. In the end, we stood back and admired our new-found skills and realized the power we had to reshape and armor certain parts of these well worn trails. Sunday was much like the day before. We woke to the smell of fresh coffee, a lovely breakfast spread, prepare trail sandwiches and back to Greenwaters for more classroom learning. My takeaway from the classroom sessions is that there are so many elements to consider with trail construction – from alignment and how the trail is designed to take advantage of the natural contours and features, to manmade structures that may need to be built to enhance our experience and durability of the trail into the future. We don’t just build trails for our own use, we build trails for all user groups to enjoy. What works for a mountain bike isn’t always ideal for an equestrian user. To drive all of this classroom learning home, after lunch we drove out to Dead Mountain so we could experience firsthand what it takes to design and build new trail. Dead Mountain is getting a reroute. The old trail was too straight and too fast and was perhaps dangerous in that you gained too much speed and had to throw on the brakes for turns. The new trail design will play more with the countours of the land and take a more playful approach and provide more opportunities for play. We walked and flagged, discussing various options and their pros and cons before coming to a group decision on alignment. The group then walked the new trail alignment, where we practiced imagining the ride for flow. Flags were then placed and then the group picked up tools and began actually clearing and cutting trail. In the end we were blown away by how much trail we were able to cut and we understand why the trail went where it did. I’m grateful for instructors like Kevin who have such deep knowledge and are willing to share it. He’ll just smile, shrug and tell you it’s his job. That’s Kevin. We’re grateful too for all the folks that shared their weekend with us to learn the finer points of trail work. I hope this is just the first step and that folks get the bug the way we have. 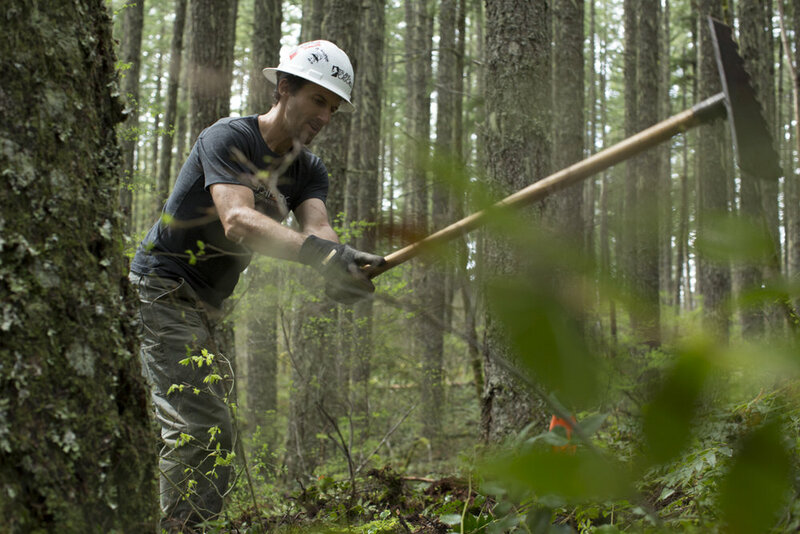 Trail work is addictive – mostly because it feels good to give back to the trails that give us so much enjoyment. As Kevin said at the end of the course – the real way to cement these skills is to come out to one of our work parties and spend a couple days on trail practicing what we learned. Thank you for becoming a steward and learning how to take care of our trails!